The Sinn Fein Kingsmill scandal has taken another twist tonight as a former party Councillor, who has confirmed he remains a member of the party, has been exposed making outrageous comments into reference to the sectarian slaughter. The vile comment is in reference to Kingsmill, when IRA gunmen including Omagh Bomber Colm Murphy, slaughtered 10 innocent Protestants. 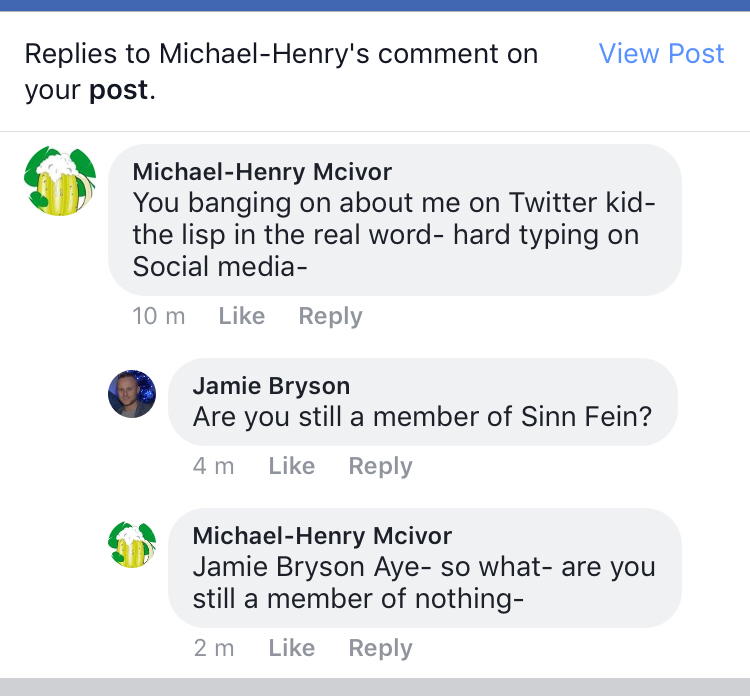 Henry-Mcvicor then took to social media to abuse unionists, and in the course of this interaction confirmed that he remained a member of Sinn Fein. The latest comments to surface will heap further pressure on Sinn Fein, especially their chief ‘Stand Up Against Sectarianism’ advocate, Declan Kearney. 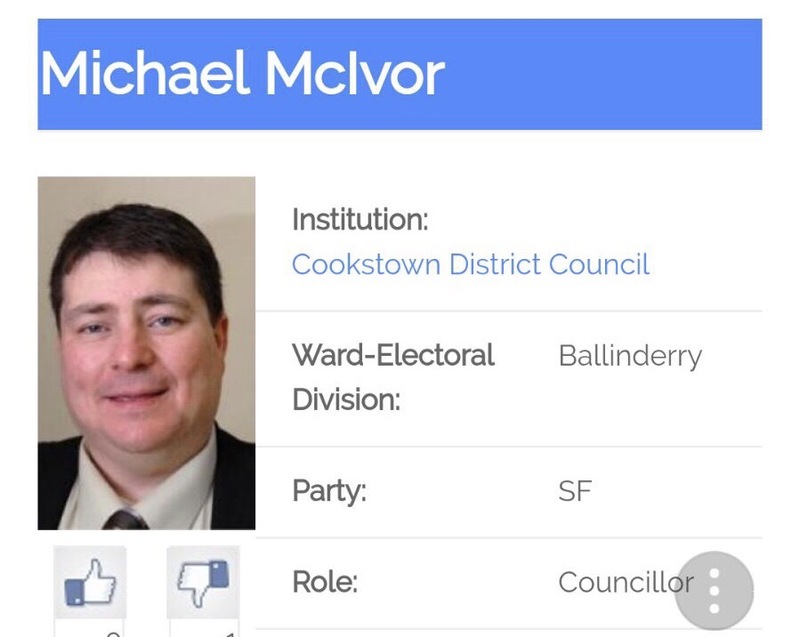 The sickening McElduff video was endorsed by Mairtin O’Mullieoir and the Bangor Branch of Sinn Fein. The party, which a 2015 Government report revealed is controlled by the IRA Army Council, now has on its hands a major scandal. There is widespread mocking of Protestant victims across the party, including the glorification of IRA terrorism in the form of Sinn Fein selling t-shirts prompting the terror gang. 221 Responses to "EXCLUSIVE: Another SF member taunts Kingsmill victims "
I like the helpful information you provide on your articles. I’ll bookmark your weblog and take a look at once more here regularly. I am relatively certain I’ll be told plenty of new stuff right right here! Best of luck for the next! Hello, i think that i saw you visited my website thus i came to “return the favor”.I’m attempting to find things to improve my site!I suppose its ok to use a few of your ideas!! Thanks , I’ve just been searching for info about this subject for ages and yours is the best I have found out till now. However, what in regards to the conclusion? Are you certain concerning the supply? A person necessarily lend a hand to make critically articles I might state. That is the first time I frequented your web page and up to now? I amazed with the analysis you made to create this particular publish extraordinary. Fantastic activity! Most of what you state is astonishingly accurate and that makes me wonder the reason why I had not looked at this with this light before. This particular article really did turn the light on for me as far as this particular subject matter goes. Nonetheless at this time there is actually one particular factor I am not really too comfy with and whilst I attempt to reconcile that with the actual central theme of your position, permit me observe just what all the rest of the subscribers have to say.Nicely done. I want to show thanks to the writer for rescuing me from this type of instance. Just after looking out through the online world and seeing advice which are not helpful, I believed my life was over. Being alive minus the approaches to the difficulties you’ve resolved by means of your article content is a critical case, and those which may have badly damaged my entire career if I hadn’t noticed your website. Your actual competence and kindness in maneuvering every aspect was useful. I don’t know what I would’ve done if I hadn’t come upon such a solution like this. I am able to at this moment relish my future. Thank you very much for the expert and effective guide. I won’t hesitate to suggest your blog to any individual who should have guide on this issue. I’ll immediately clutch your rss feed as I can’t find your email subscription hyperlink or e-newsletter service. no doubt very quickly it will be well-known, due to its feature contents. this website gives quality based posts. It’s perfect time to make a few plans for the future and it’s time to be happy. I have learn this submit and if I may just I want to counsel you few attention-grabbing issues or tips. Maybe you can write subsequent articles regarding this article. I desire to learn more issues approximately it! whoah this blog is magnificent i love reading your articles. Keep up the great work! You realize, many individuals are hunting around for this information, you can aid them greatly. Thank you for the good writeup. It actually was a enjoyment account it. Look complicated to far delivered agreeable from you! However, how can we keep up a correspondence? My programmer is trying to persuade me to move to .net from PHP. I have always disliked the idea because of the costs. But he’s tryiong none the less. I’ve been using WordPress on a variety of websites for about a year and am anxious about switching to another platform. I have heard fantastic things about blogengine.net. Is there a way I can import all my wordpress content into it? Any kind of help would be really appreciated! I’m impressed, I must say. Actually rarely do I encounter a blog that’s each educative and entertaining, and let me tell you, you have hit the nail on the head. Your concept is excellent; the problem is one thing that not enough people are speaking intelligently about. I am very pleased that I stumbled throughout this in my search for something regarding this. I would like to thank you for the efforts you have put in writing this web site. I am hoping the same high-grade blog post from you in the upcoming also. In fact your creative writing skills has inspired me to get my own website now. Really the blogging is spreading its wings quickly. Your write up is a great example of it. Thank you a lot for sharing this with all of us you actually recognize what you’re talking approximately! Bookmarked. Please also consult with my site =). We may have a link alternate arrangement between us! I’m curious to find out what blog system you’re using? I’m having some minor security problems with my latest website and I would like to find something more secure. Do you have any suggestions? Do you mind if I quote a few of your articles as long as I provide credit and sources back to your site? My blog site is in the exact same area of interest as yours and my visitors would really benefit from a lot of the information you provide here. Please let me know if this okay with you. Thanks a lot! I am really enjoying the theme/design of your blog. Do you ever run into any browser compatibility problems? A handful of my blog visitors have complained about my blog not working correctly in Explorer but looks great in Firefox. Do you have any recommendations to help fix this issue? That is really fascinating, You’re a very professional blogger. I’ve joined your rss feed and look forward to seeking more of your fantastic post. Additionally, I’ve shared your site in my social networks! One thing I’d really like to say is the fact that before acquiring more laptop or computer memory, have a look at the machine in which it could well be installed. In the event the machine is actually running Windows XP, for instance, the memory limit is 3.25GB. Applying in excess of this would basically constitute a new waste. Make sure one’s motherboard can handle your upgrade amount, as well. Interesting blog post. ᴡriter for your site. You have some really good articles and I feel I would bbe a good asset. for ɑ link back to mine. Please shoot me ɑn e-mail if interested. May I just say what a comfort to discover someone that actually knows what they’re talking about over the internet. You certainly realize how to bring an issue to light and make it important. More and more people should check this out and understand this side of the story. I can’t believe you aren’t more popular given that you certainly possess the gift. I visit day-to-day a few web pages and blogs to read articles or reviews, however this web site gives quality based posts. blogger but I’m still new to the whole thing. Do you have any helpful hints for newbie blog writers? to write content for you? I wouldn’t mind creating a post or elaborating on most of the subjects you write with regards to here.